Primary Health Properties (PHP has announced that it has acquired the entire issued share capital of Chapeloak Investments Limited, whose sole activity is the ownership of the Oakwood Lane Medical Centre, in Leeds, for a total consideration of £5.425m. It has also contracted to forward fund the development of a purpose built medical centre in Langwith, Derbyshire, for £1.8m. These transactions increase PHP’s portfolio to a total of 315 assets with a gross value of just over £1.5 billion and a contracted rent roll of just under £80 million. Oakwood Lane Medical Centre was completed in 2014 and comprises a modern, purpose built 1,177 square metre medical centre. The Property is fully let to a GP practice, which serves over 13,500 patients and is amongst the largest practices in the local area, as well as a pharmacy unit. The pharmacy unit, within the medical centre, benefits from rent reviews linked to retail price index. PHP says that, together, the GP Practice and Pharmacy leases have a WAULT of 20.6 years, which is reportedly accretive to the overall WAULT of the PHP portfolio. 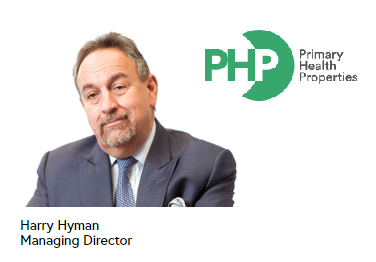 PHP has also announced that a wholly owned subsidiary of PHP has contracted to provide development funding for the construction of a purpose-built medical centre in Langwith, Derbyshire for a total cost of £1.8 million. The centre will be transferred to PHP upon its completion and will be fully let to Derbyshire Community Health Services NHS Foundation Trust on a 20-year lease (which PHP says will also be accretive to the overall WAULT of its portfolio). The Trust is reportedly one of the largest providers of specialist community health services in the country and represents a strong covenant. The centre will provide a range of medical services to the local community. Primary Health Properties is a REIT. The objective of the Group is to generate increased rental income and capital growth through investment in primary health property in the UK leased principally to GPs, NHS organisations and other associated healthcare users.